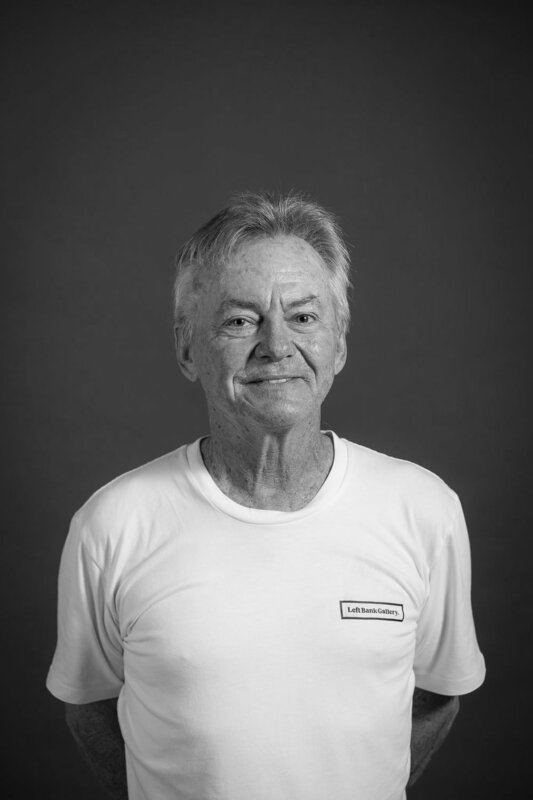 Bob has been framing for over 30 years and knows the ins, outs, ups, downs and arounds of his craft. It wasn't until after managing the supermarket in Main Beach and working as a real estate agent that he saw potential in the Left Bank framing shop across the road. It only took a year for his passion to ignite and (like a fine wine) has only developed over time. Bob loves a chat, especially on anything with four wheels that shares his age. Since meeting Bob in high school in 1971, Sandra (the dynamo of the duo) has co-owned and operated businesses for the majority of their ~50 year partnership. Until recently Sandra rejected any notion of a creative bone in her body, seeing herself to be more suited to the precise logic in book work and accounting. But as time went on, her finesse to pair beautifully thought-out & complimentary finishes to art became undeniable. Sandra sees it as an outlet to apply her love of fashion and trends to her work and is inspired by evolving framing styles. We have many customers who simply drop off their art to Sandra and trust her to work her magic. Joining the family business in 2009, after an extended overseas jaunt, Toby saw potential in his parents humble picture framing business, by adding graphics and digital printing to the range of services offered. Since then, Left Bank's digital arm has grown rapidly. Trained in 2003 as a graphic designer, Toby now looks after commercial art consulting and business development, along with dreaming up what the next piece of equipment Left Bank may or may not need to invest in. His dreams are big but Toby finds balance with his grey toy poodle, Napoleon and thirst for (laughably) tiny, piccolo coffees. Koreena has been a cheerful helping hand to the Simm family since 2013 and joined the team full-time in 2016. Known for her ingenious techniques (near miracles) performed on the reg to anything we throw at her, her accuracy, attention to detail and speed is unmatched. Koreena has almost 40 years experience in the industry and tirelessly applies her honed skills to elevate the beauty of any art that finds it's way to her. She's the fastest (staple) gun in the East and there's no messing around with her! Having joined the business in 2018, Brie looks after the process from consultation through to collecting your finished work. You can find her helping clients choose the right frame for their work, in the workshop putting it all together, or up a ladder in the showroom hanging art. She gets a lot of thrills seeing all the incredibly diverse work that comes through our doors and has to be restrained from spending her pay cheque each week on the beautiful work from local artists! Our newest team member, Jarrad specialises in all things wallpaper. Being a seasoned graphic artist with almost 10 years experience in the field (initially taught by Toby himself), wallpaper design is aptly matched with his diverse skill set. With a life-long interest in art and illustration, he loves the excitement of progressing his creations from consultation, to captivating wall displays. He enjoys the variety and problem solving required in each project to achieve beautifully impressive results that truly make an impact. Julia specialises in artwork scanning & Giclee printing but can also help you to print, edit and restore family photos or create layouts and photo collages. She has extensive experience in digital media, colour management and an eye for detail. Julia has known the Simm family since she was born but was welcomed into their work family in 2014, fulfilling her passion for art and all things creative.